Last week Britain's Parliament voted to invoke Article 50. Which means they finally did it. The Brits have started the process to leave the EU. While the wait for the vote on Brexit is finally over, Britain's Parliamentary vote of approval is only the beginning. It is the beginning of a beginning of tense, fraught negotiations between Britain and the Mandarins in the EU to determine exactly what Brexit will look like. Which means the waiting will go on, driving an era of uncertainty in which the only (possible) certainty is the timeline of upcoming negotiations: it will take Britain 2 years (or even longer) to formally exit the EU. But this period of uncertainty is bad news. Economies hate uncertainty. And if you're presently thinking of moving to Ireland to work and live here, Brexit - and the uncertainty which that will surely bring over the next few years - is also bad news. Or as The Donald might say: It's very, very, very bad. If you believe the newspapers, Brexit is already having something of a negative effect upon the Irish economy. The biggest losers right now are Irish exporters and the people they employ. Due to the stunning weakening of UK Sterling, Irish products cost British consumers a whole lot more - something like 15 percent more, to be precise. Which is problematic for Ireland because the UK is our largest trading customer. We're all praying these losses will not turn into a deluge of lost opportunities, wealth, and subsequent employment as Irish companies attempt to shore up revenues within a market of shrinking demand. Back in the old days, before the peace process in Ireland took hold, this country had a so-called 'Hard Border' with Northern Ireland (and hence the UK). I well remember driving from my home in Navan to work with customers in Belfast - and at the Border I would be confronted with passport control and nasty soldiers carrying large guns who wondered what I was doing up there. With peace, the hard border disappeared. Today, anyone can drive from South to North or North to South without encountering the above nuisances. 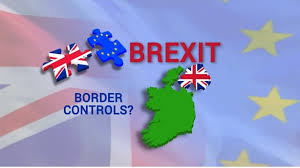 Too, the 'soft border', together with the fact that both Ireland and Britain were members of the EU meant free trade: goods and services could pass freely between the two countries without incurring any sort of tariffs. This resulted in terrific mutual opportunities for people on both sides of the border. But because of Brexit, all of that might change quickly. It is possible that Britain will enact a 'hard exit' from the EU. Should this happen, we will once again see a Hard Border between the two countries. Passport controls will once again be established. Tarrifs on goods and services will be imposed. This will result in the further cooling of trade between the two countries. Which is very bad news, not only for the people already resident on either side of the border, but for those new immigrants looking to make a home here. Very, very bad indeed. But - and do keep this in mind - it's not all bad news. Global companies currently headquartered in London or other parts of the UK may find Britain's exit from the EU strategically trying. For that reason, many are already looking to move to EU countries to maintain a European presence. The reason? They too are worried about tariffs, taxes, and other legal and trading consequences as Britain re-negotiates its relationship with Europe. Ireland already looks to be a beneficiary of this change. There's been a surge of interest in Ireland, particularly within Dublin's docklands - based Financial Services Centre. British-based financial services and insurance companies are keenly eyeing the strategic value of such a move. If this happens, Ireland could experience huge demand for lawyers, managers, analysts, and administrators with financial services experience. As I've long suggested: if you're looking to move to Ireland, NOW IS THE TIME. But tread carefully and go in with your eyes wide open. Ireland has an open economy - which means things here can change on a dime. If the temperature caused by Brexit turns from cool to cold, it could spell disaster for Ireland's economy. Are You Qualified to Live and Work in Ireland? To find out, go to http://survivingireland.blogspot.ie/2016/11/getting-job-and-living-in-ireland-trump.html. See end of article. Interesting perspective. We went to Ireland a few weeks ago for vacation. Interestingly, we met up with a few of our friends in Dublin who said that Brexitit would only be good for Ireland. They stated that many of the tech and finance companies with a presence in London, will be looking to move to Dublin as their European center for operations. This is due to the fact that Ireland primarily speaks English. Many locals told us if we wanted to move to Ireland, to do it now - get in on the ground floor before it grows significantly - which they all seem sure it wil do. I guess time will only tell. Thanks so much for the feedback, Anonymous. While I agree multinationals (like tech companies) may move here from London (due not only to English as a first language but obviously because co's want to keep a footprint in the EU), I'm not sure about other folks' comments: "...get in on the ground floor before it grows significantly". As mentioned in the post, growth could be significantly stymied due to Brexit (particularly in food and drink industries). While tech and other areas should continue to grow nicely, I worry (and so many others here worry as well) that Brexit will prove catastrophic for the country. Good point. I'm sure those who live in Dublin vs. those who live outside the nation's capital will have differing opinions on the impact of Brexit, depending on their industry and field of work.